It won’t be long before the icy blasts of winter are upon us. Time to put away the rakes and get out the snow shovels and salt. And, while you’re at it … make sure your elderly parents are taken care of, too! Even in the best of circumstances, older people face challenges in their day-to-day lives: shopping for groceries, preparing nutritious meals, dealing with loneliness, managing multiple prescriptions, and even getting to the doctor. Add cold, ice, snow, shorter days and longer nights, and higher utility costs into the mix and the challenges can become almost insurmountable. Personal appearance/hygiene. Failure to take care of one’s personal appearance and personal hygiene may mean nothing more than it’s time to move the laundry room and install grab bars in the shower. But, it can also signal depression, isolation and loneliness, changes in vision, or cognitive decline. Changes in mood or attitude. Do your parents seem more low-energy than before? Do they seem not to care about things and people? Have you noticed mood swings? Poor nutrition/lack of interest in food. Take a look in the fridge. Is it stocked with appropriate amounts of good, healthy food? Or spoiled/expired food? Is your parent eating nutritious meals or just eating something now and again? Is there unexplained weight loss or gain? Damage to the car. Dents, scratches, torn off mirrors and bumpers can be telling, especially if the parent can’t remember how the damage occurred, or had no awareness that it happened. Lack of interest in things that once were important. Whether it was a rabid interest in OSU basketball; travel; music; or crafting, when an elderly parent gives up something that once was a passion, it is cause to notice. As much as we want to be there for our aging parents, it’s not always possible. Care Companions of Ohio, with offices in Mansfield, Marion, Norwalk, and Portsmouth, can help. 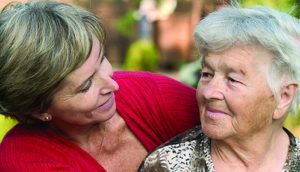 Care Companions can help with bathing, dressing and toileting; provide companionship services such as reading, visiting and playing games; shopping (groceries, clothing, pharmacy); transportation to medical appointments, beauty/barber shop; cleaning and laundry services; meal preparation; and much more! For more information about services available through Care Companions of Ohio, please call (855) 703-8209.